I saved the best for last. This was the last project in our three year series. It was also the best selling of my ready made hats when I was producing hats for sale. This is NOT a beginner project. The construction is a bit tricky and there is just a LOT going on. There are multiple layers of lace, pleated silk ribbon and bunka trim, ribbon roses, and more! But the end result is just stunning. A 1/4 scale pretty pleater is required for this design. 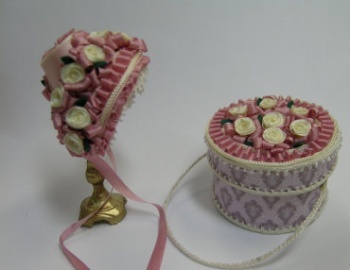 The matching hatbox is just as elaborate. This ensemble is a real show stopper.